Protein serves growth in the muscle mass and its maintenance after hard training. 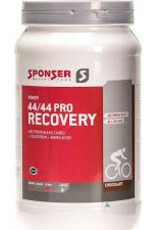 44/44 PRO RECOVERY is a high quality, naturally sweetened protein supplement with “all- in-one” character. The combination of CFM whey protein, quickly available potato- and egg protein hydrolysates and micellar casein take care of a quick as well as a slow amino acid stream into the blood. The carbohydrates in form of barley and rice starch hydrolysates serve the regeneration of the glycogen storage. 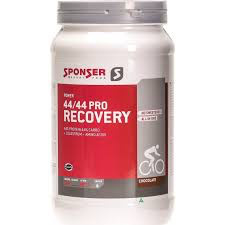 44/44 PRO RECOVERY is especially suitable for junior athletes in game and team sports with a focus on muscle mass build up. Enriched with colostrum, cows first milk, as well as L-leucine and L-glutamine. Protein powders 44% (protein isolates from cross-flow filtration [whey, milk], micellular casein, bovine colostrum 4%, protein hydrolisates [casein, whey, potatoe, egg]), sucrose, starch hydrolisates 11% (barley, rice), defatted cocoa 8%, fructose, amino acids 4% (L- leucine, L-glutamine), caramel powder, 2 minerals (sodium citrate, magnesium lactate), flavours, emulsifier soy lecithin, 10 vitamins (ascorbic acid, nicotinamide, alpha-tocopheryl acetate, calcium pantothenate, pyridoxine hydrochloride, riboflavin, thiamine mononitrate, folic acid, biotin, cyanocobalamin). Only 1.1 g lactose per 100 g.